Thursday, we took the kids to Oklahoma City so we could go to a Day out with Thomas on Friday. 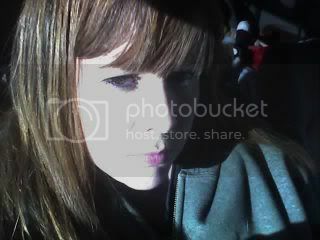 I have lots of pictures to scrap from that so I'll get on that pretty soon. I've also got a few more projects done. I'm just posting four of them...the rest are for a workshop I have on Friday night. I cased this one from the October 2007 issue of Papercrafts magazine. You can find it on page 101. It's a card by Jessica Witty. 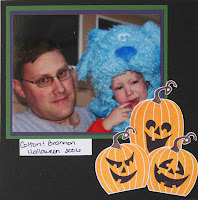 I followed her pattern pretty closely, substituting Stampin' Up! products. This was a lot of fun to make!! Thanks for the inspiration Jessica!! I found the box pattern on the Stampin' Up! Demonstrator web site...one of the perks of being a demo! This box has a lid but I haven't figured it out yet...I think the pattern is wrong but it may just be me! I cut my pattern out of Only Orange cardstock. 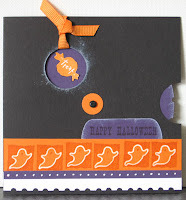 I scored all the fold lines and then I stamped my little pumpkin (Bitty Boos Too) with Only Orange Classic ink. Then, I assembled the box. Next, I inked up my other pumpkin image (Batty for You) with Stampin' Write Markers (Only Orange, Close to Cocoa, Glorious Green) and stamped on Whisper White cardstock. I punched it out with a 1 3/8" circle punch. I adhered it to a scrap of Only Orange, centered it in a 1 1/4" circle punch, and punched it out. I punched out a scallop circle from Basic Black and attached the other circle embellishment to the center. I adhered a piece of black gingham ribbon around the box making the ends meet in the center of the front panel and taped them down. 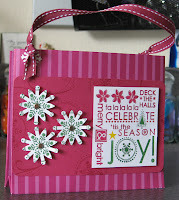 I adhered the scallop embellishment over the ribbon ends with Stampin' Dimensionals. Then, I finished it by inking the edges with Only Orange ink...this should've been done after I assembled the box but that's too much forward thinking for me!! I made this pretty simple to use as a make-n-take for a workshop. You can probably look at it and figure out how to make it. The stems were stamped and cut out separate and then glued to the tops of the pumpkins. If you have any questions about it, feel free to leave a comment or email me. The pattern for this is also found on the demonstrator website. The scallop on the flower center is made with the 3/16" corner rounder and dotted with the More Mustard marker. A few stampers were talking about this pouch on Splitcoaststampers and someone posted a link to some instructions for it. They can be found at http://www.stampingwithroxy.typepad.com/. Her instructions are very easy to follow...and humorous too! I think this was originally done at one of the Stampin' Up! Regional meetings in the last month or so. Supplies: All from SU! except for where noted: Season of Joy stamp set; Purely Pomegrante, Whisper White cardstock; Holiday Harmoney Designer Series Paper; Purely Pomegranate, Garden Green Classic ink; Rose Red, Garden Green, Summer Sun Stampin' Write markers; Purely Pomegrante stitched grosgrain ribbon; silver brads; Stampin' Dimensionals; snowflake punch; 3/16 corner rounder punch; Crop-a-Dile and snowflake eyelets (We R Memory Keepers)--We sell the Crop a Dile now too but mine is the purple one!! Well...that's it for now. Hope you enjoyed looking at them! Love your boxes! I especially love the pumpkin one! Wow! You HAVE been busy! Cute stuff!